When it comes to plumbing leaks, we often imagine the annoying drip, drip, drip of a faucet, or unsightly water stains on the ceiling or wall. But those types of leaks don’t make up the majority. For every other kind of leak, you’re going to need to take some indirect approaches. We’ll explain how. Unless your leak is slowly developing as a puddle across your kitchen floor, it’s more likely that you won’t know you have one. A majority of leaks will occur behind walls and out of sight. So aside from water damage and other obvious signs, here are some ways to tell that a leak is present. A sudden spike in the water bill is your first sign of a leak. Of course, that means you’d have to wait until the bill arrives just to find out. While finding out you have a leak through your bill is not the preferred method, it’s better to find out sooner rather than even later. Not sure if you have a leak? You can always confirm by checking the water meter. The meter’s job is to monitor how much water is running through the system. If you turn off the water and ensure that none of the appliances are running, you should have a meter that stays still. If not, you most likely have a leak. We don’t think you should go finding leaks on your own. 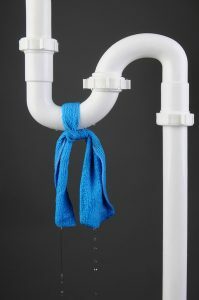 Every minute you waste trying to find a leak can bring more damage to your home while driving your water bill higher. We suggest turning off the water and calling on the help of a plumber in Deptford Township, NJ. With that being said, we won’t leave you without information on how to find a leak. After all, you might stumble upon one on accident before encountering any of the above signs. As previously mentioned, many leaks happen behind walls rather than right at your fixtures. In that case, you’ll need to listen for the sound of rushing water when no appliances are being used. Following the sound can also help you pinpoint the location of the leak to confirm if there’s any watermarks or damage. Slab leaks are a type of leak that form right below the foundation of your home. They can make themselves known by damaging your floors or leaking water from under the ground. If those signs don’t crop up, you might be able to feel them. If a hot water pipe bursts, you should be able to feel the warmth from the floor. Need help finding a leak? Contact SPS Mechanical Inc. today to schedule a service!